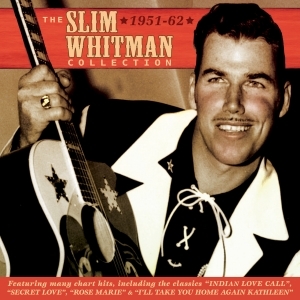 Slim Whitman was a country and western singer with a highly distinctive vocal style, notable for his effortless falsetto range and yodelling ability, which made his records unmistakeable. With a broad repertoire that encompassed pop standards and folk tunes as well as straight country songs he had a strong crossover appeal, and was one of the relatively few country artists to achieve lasting popularity in Europe, to the extent that he had a string of hits in the UK, including a landmark No. 1 with “Rose Marie”. This great value 54-track 2-CD collection focuses on the key first decade and more of his long chart career, comprising the A sides of his singles from the era a number of the B sides (with the caveat that it was not always clear which was the A side) and including all the fifteen or so US Pop, US country and UK chart entries he had during this period. It features stand-out hits like “Indian Love Call”, “Keep It A Secret”, “Secret Love”, “Rose Marie” and “I'll Take You Home Again Kathleen”. It’s an entertaining overview of the first and very important period of his career, when he established his considerable reputation, and is a fine showcase for his unique talent.